This is my friend, Audrey. She has a blog. It’s called The Idea Girl. Because of…well…the ideas. Occasionally my name or some activity I have participated in is mentioned on there, because we have many of the same ideas about certain things and live close by each other and our kids are friends. It’s really cool. And if you follow that link up there, there are even some pictures of me and my kids mixed in with her kids and some blueberries. I spend time thinking about things I shouldn’t. I’m not talking about forbidden, terrible things. I’m not even talking about big dramatic things. I’m talking about things that shouldn’t get to use up my thought cycles. I think ‘hey, if I change lanes now, then I can get around this other car and I might get where I’m going a few seconds earlier.’ And it doesn’t end there. If for some reason I don’t change lanes and pass, then I might get stuck at a red light, and spend the whole 30 seconds thinking about how if I’d gotten around them I wouldn’t be stuck at a red light right now and then it’s not just a few seconds-it’s a whole minute (See? I told you). Or I think about how I should separate out the kale from everything else in my fridge so I can make soup later. But everything’s so mixed together, and what am I going to do with all the other greens that a friend gave me (I don’t even like them, but they were given to me and now I have a responsibility to not waste them, right?)? And there’s broccoli mixed in there too, and radishes, and oooh I detest radishes, but maybe I could pickle them. Yes, pickle them. Pickle them? Is that a thing? I’ve never heard of that, but it seems like mixing them with sugar and vinegar might help a little, and they do have a really nice crunch. Maybe I’m being unfair to the radishes. Oh, it’s time for dinner. Humm…how about some scrambled eggs? Rather than ‘hanging up’ on these thoughts I have been too tired to stop the brain cycling in that direction and steer myself to more productive thoughts. But I think it’s making me more tired. I spend a lot of time trying to conserve things. I try hard to drive less, walk more, buy less, waste less food…the list goes on. One of things I am adding to it is that I need to conserve my brainwaves more intentionally so that I don’t feel like I’ve run out by about 2 p.m. and spend the rest of the day in a fog. I get so busy. Or at least, I feel busy. But then I look back over my day and think, ‘what did I do?’ It is very easy to feel like my life is mundane. Sure, on an up day I am able to intentionally “Do ordinary things with extraordinary love” as Mother Theresa said. But there are many times when I wish that I could be…cooler. Being a missionary in Africa. Having a career. Doing something that really changes the world. But what if little things that I do every day actually are important? What if thinking intentionally about the way we live our life right in a Cleveland suburb can have an effect on the way that our neighbors (both literal and figurative) think about themselves, their neighbors, their children, the planet…etc. etc. What if, by being who God made me to be, I can bring out the best in other people? What if I can help them be more who God made them to be? What if they can help me too? I could be much better at observing and learning from the people around me. I am surrounded by people who are living out the truth in amazing ways. Maybe it really is important to discover the truth other people hold so that we can bring out the best in each other. Right now I am trying to figure out what I think about factory farming as it relates to my own and my family’s eating. I have a problem with eating pigs that didn’t get to have tails. Or chickens that were never allowed to spread their wings. Or cows that ate, um, other cows (yuck!). I have not bought food with any of these things in quite some time and I have come to a point where I have a hard time eating said food in restaurants or at friends’ houses. But I have another conflicting problem…people are very, very important to me and I don’t want to make it hard for people to relate to me. If I sit down at someone’s table and they put pepperoni pizza in front of me, what do I do? Is it more important to share in the meal and so advance our relationship by being ‘a part of’, or is it more important to stick to my value of eating in a thoughtful way? People I really love don’t share my value regarding ethical treatment of animals. Is it important to share a meal with them, thereby affirming our friendship? Yes. Is it important to me to be able to eat food that I can identify all (or at least most) of the ingredients of and that was produced in a way that isn’t wasteful or cruel? Yes. It is difficult to sort out what to do in this instance, but I often come up against the problem of how to think about it when my own actions don’t match up to what other people are used to. 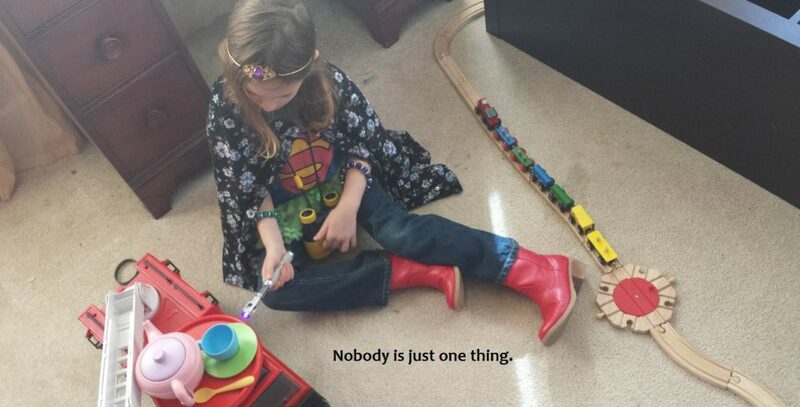 It’s not that I expect everyone else to conform to my way of doing things…most people are not going to use cloth diapers, make their own toothpaste, or grind their own flour. I’m fine with that. But when people hear that I do these things, sometimes they take it as a silent rebuke or they assume that I am out to spread the gospel of baking soda as a cleaning agent. Paul told the Romans that they should always be ready to give an answer about themselves to anyone who asked. I guess I’ll start there.